We all remember the person who first opened our eyes to the wonderful world of riding dirt bikes. That person, no matter who they are, will never be forgotten. For retired Marine Corp infantry soldier Kristopher Puffer, that person was his cousin Davy. 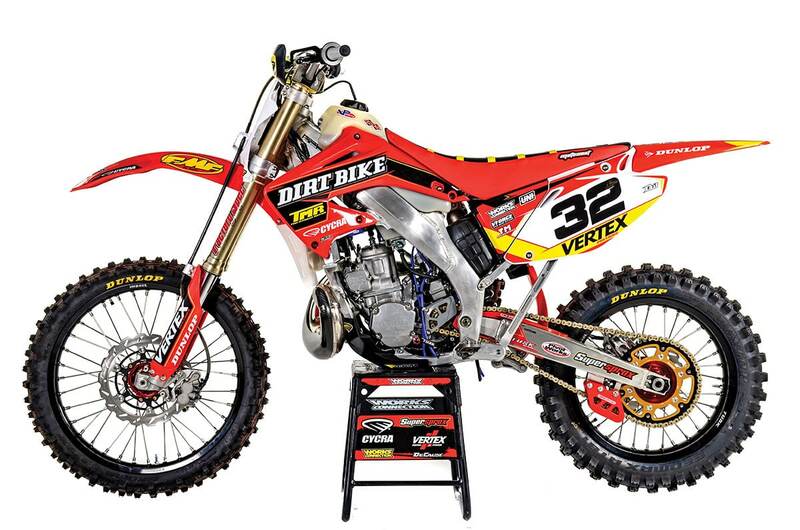 A few years ago Puffer was given his cousin’s 2004 Honda CR250R two-stroke by his cousin’s widow. He needed some help building a bike that would honor his cousin’s love of off-road riding. You know we are all about two-stroke builds, and one with a special meaning like this gets us fired up. When we first saw our build, we were very surprised. For a bike almost 15 years old, it was in great shape. Cousin Davy had taken pretty good care of the machine, so our job was going to be easier than normal—or so we thought. We still stripped the bike down to the frame and inspected everything. This is when you find out how much work is really needed. You can imagine the horror stories we have witnessed over the years. Cousin Davy’s bike didn’t scare us; in fact, beyond the normal wear items, there were no major issues with the chassis. Displacing terra firma is no problem with the performance upgrades. We replaced all the suspension linkage and pivot bearings using a kit from All Balls Racing. The fork and shock hadn’t been touched since the bike rolled off the assembly line in 2004, and, as you can imagine, the suspension needed some major TLC. Ken Wheeler from Factory Spec Suspension handled rebuilding both the shock and fork. Since everything was stock, he also valved everything internally for the new off-road application and gave it new springs all around. The goal was to increase bottoming resistance without sacrificing overall rider comfort on the trails. A complete bike with a Nickel Wurks bolt kit from Specbolt not only makes the bike look trick, but these bolts are stronger than the OEM units. Other upgrades to the chassis included a TM Designs Slide-N-Glide kit, Supersprox Stealth rear sprocket and O-ring chain, and a Cycra plastic skid plate. Cycra doesn’t actually make a skid plate for the 2004 CR250R, so they highly modified a 2011 Kawasaki KX450F skid plate. When the engine came apart, we weren’t quite as lucky in the damage department. The cases were in perfect condition, which was a good thing, because parts numbers are no longer available from Honda; however, internally, just about anything with a bearing attached needed to be replaced. Cousin Davy had simply worn out everything. The cylinder was re-plated by Millennium Technologies, and Tom Morgan did some grinding on the ports while it was apart. A Vertex Pro Replica piston kit was installed that included a piston, rings, and clips. 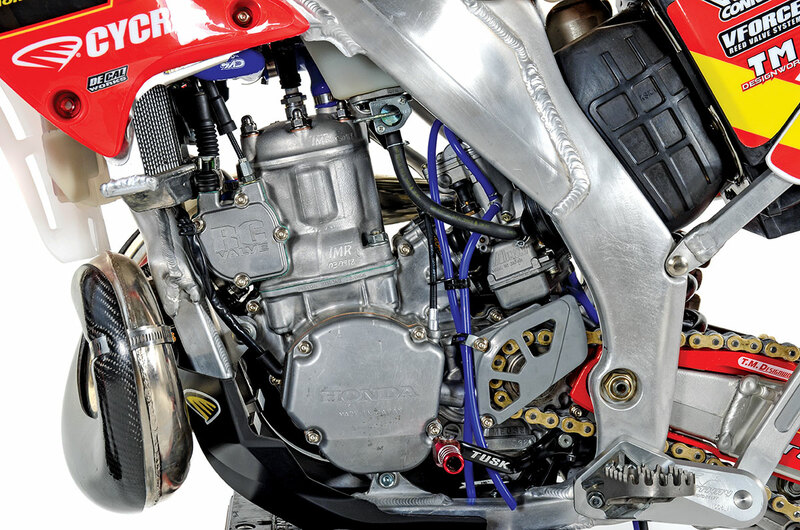 A Moto Tassinari VForce reed cage would help get more fuel into the cylinder, while an FMF Gnarly pipe and shorty silencer would help it get out faster in hopes of boosting performance all around. 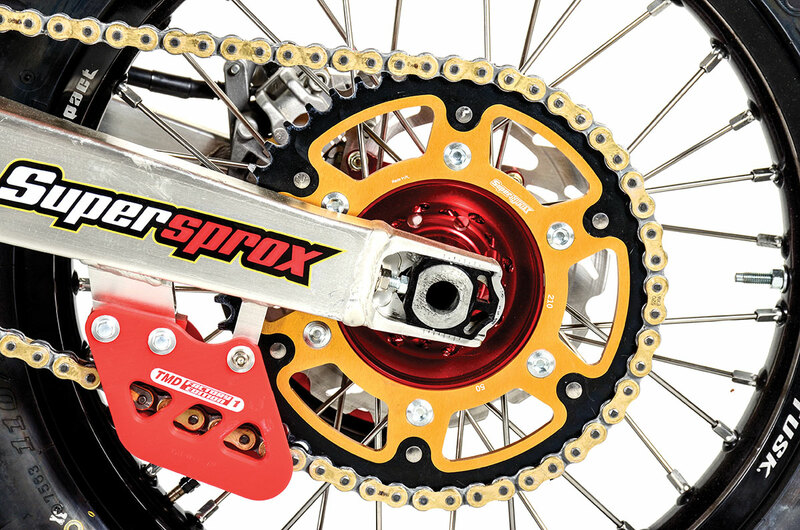 TM Design’s Side-N-Glide kit and a Supersprox Stealth rear sprocket are an almost indestructible combination. We also upgraded the clutch to a complete Billetproof unit from Hinson Racing. The basket, inner hub, pressure plate and clutch cover are machined in-house out of T6 aircraft-quality aluminum and then hard-coated for improved wear life. We also installed Hinson Akadized aluminum clutch plates that are lighter than the OEM steel models and are designed to dissipate heat better for longer life. Once the heavy lifting was done, it was all about making it look good. We decided to stick with the classic race look of that era, choosing the Cycra Powerflow plastics and Classic Stadium front plate. Since this was an off-road build, an IMS oversized tank was a must. As we always say, more fuel equals more fun. The wheels on cousin Davy’s bike had seen better days. As a matter a fact, you couldn’t really describe them as round. We replaced them with a complete set from Tusk Racing and made the rear an 18-inch model to absorb some impacts, lessening our chances of getting flats.A lot of our older two-stroke off-road builds are all about nostalgia and not much about the actual performance. This bike was all about performance from day one. Kristopher was going to log hours on it, and we wanted him to enjoy those hours. Of course, the Cycra plastics, Decal Works semi-custom graphics and Tusk wheels made the project look good, but this bike rips! 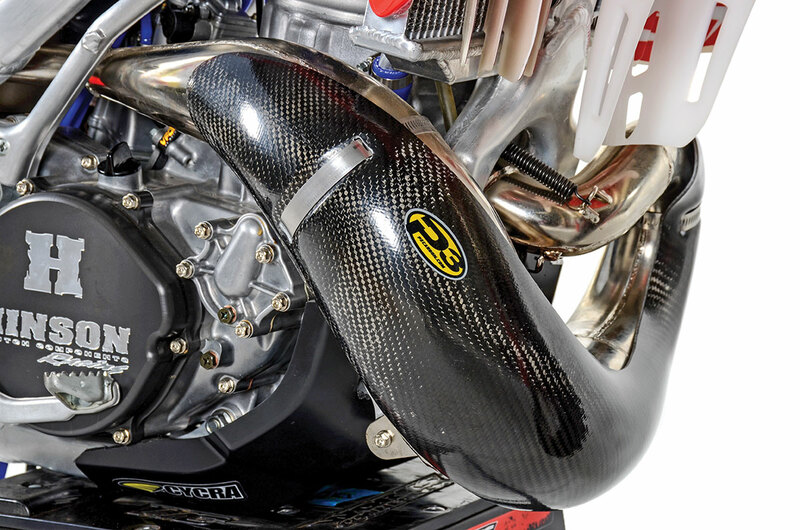 The P3 Carbon pipe guard added some protection to our FMF Gnarly exhaust. All the engine mods, both internally and externally, really brought it to life. It doesn’t have the hit down low like a modern off-road two-stroke, but it comes on strong in the midrange and pulls strong all the way to the top. We are now running a little bit of VP race fuel in it just to prevent detonation. The suspension is a little on the soft side when getting aggressive on the trail but offers great rider comfort for those long days in the saddle. 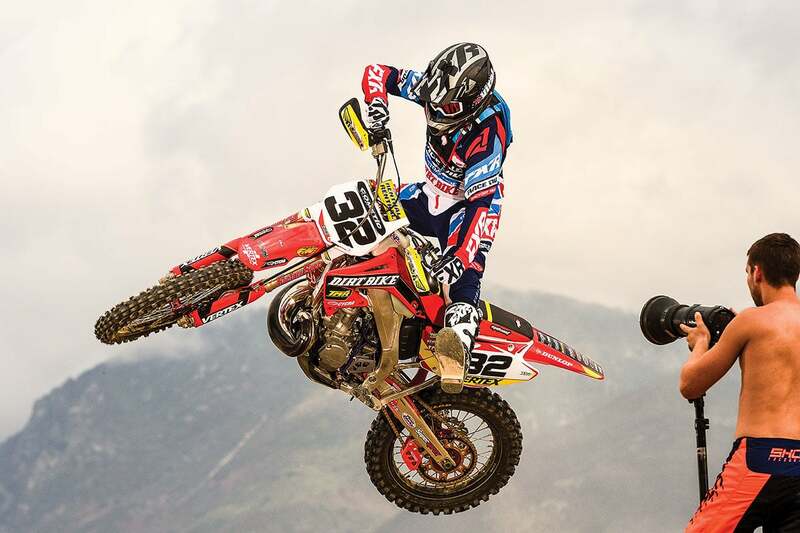 We think cousin Davy is looking down on our off-road project CR250R with a big smile.